Although the snow may seem harmless at first, the weight of snow and an accumulation of ice can cause your fence to bend and crack over time. As we experience a handful of unseasonably warm days this February, we may still experience inclement weather in the last few weeks of winter. With this, it is especially important to protect your fence at the end of the month, as freezing temperatures and moisture in the air can pose serious risks to your fence and landscaping as winter comes to a close. Don’t start the year off with a damaged fence! Instead, consider these five easy tips so that you can comfortably enjoy your yard in the warmer days of spring. 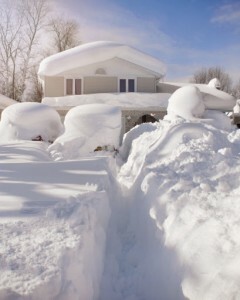 If you are shoveling or using a snowplow to clear your driveway, be sure to redirect snow piles away from your fence. Although the snow may seem harmless at first, the weight of snow and an accumulation of ice can cause your fence to bend and crack over time. The best way to keep your fence clear of any unwanted snow or ice is to proactively brush it off to the best of your ability as it snows. Whether you’re out clearing your driveway or building a snowman, consider using a broom to get rid of ice and snow on your fence to reduce the risk of buildup on the wood. Changes in temperature can affect your fence by shifting soil and displacing it throughout the season. If you notice that winter weather has taken its toll on the ground holding your fence, be sure to contact the professionals for repairs as necessary. In any season, particularly in the winter, it is always smart to trim the branches surrounding your fence. Doing so will ensure that no damage is caused by breaking limbs that have become heavy with ice and snow during a winter storm. Just as you would check your home, be sure to check your fence for damage following winter weather in order to monitor any cracks or holes caused by changing temperatures and moisture. As the weather starts warming up in the spring, you will have a better idea of what repairs need to be made and other preventative measures to take throughout the year such as adding a protective stain to your wooden fence. Ready for Higher Quality Fences?